Service it, wear it, write it down: Zenith and Omega family heirlooms come home. And prepare to leave again. Ever consider yourself a time traveler? When it comes to the passage of time, you could consider yourself standing in the river of time as it flows past, enduring its force and influence. But you might think of yourself as floating with the current as it moves through the landscape, revealing new things to you. Thus we are both endurers of time, living our lives as time passes around us at a rate that feels normal, and also travelers through time, drifting with the current and encountering things both expected and unexpected. Time doesn’t stop passing when we’re gone, and the durable things we leave behind — the Chauvet-Pont-d'Arc Cave art, the Mackinac Bridge, our personal belongings — can continue their endurance of time without us. Hand tools in particular have the ability to continue after us, and offer to their new owner not only new utility, but also a physical reminder of us. A useful, physical thing, held in the hand or carried in the pocket of your parent or grandparent, now finds itself held in your hand or carried in your pocket. The things that survive us. Fashion is one thing, lurching this way and that to satisfy our innately human need for novelty, but in the case of a watch, it’s the window dressing on what is just good design. The invention of the round dial with 12 indices evenly spaced at 30 degree increments combined with a hand that passes radially over it has not been improved upon as an analog of the passage of time, regardless of what mechanism drives the hand. Like a hand tool, a good watch can serve its owner for decades and then be handed down to a new owner for further decades of reliable service. It seems so fitting that something designed to observe the passage of time could also turn out to be an endurer and traveler of time itself. Occasionally I get requests for information regarding hand-me-down LL Bean watches that someone has inherited. (Hey, it’s a weird thing to have expertise in, but I’m good with it.) My advice is always: get it serviced, get it on someone’s wrist, and write down what you know about it. So I took my own advice when my dad presented me with his ca. late-50’s-early-60’s Omega. Case ref 6042 caliber 284 Omega wristwatch. A gentleman’s steel wrist watch. About ten years ago I asked my father about the watch I remember him wearing every day when we were kids growing up. I had very strong and happy childhood associations with it, and remember him winding it every morning and wearing it for work and play. I remember the big, super groovy leather band it lived on in the late-60’s, and the metal twist-o-flex it lived on thereafter. I also remember him taking it to a watchmaker at some point for what must have been a well-needed service. 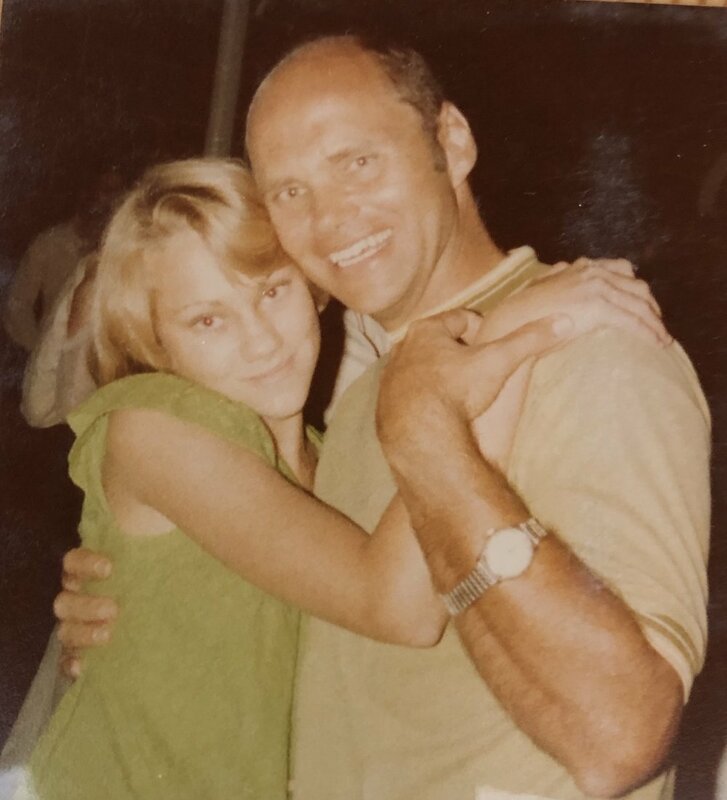 At a family wedding in 1977. Dad wearing the Omega and dancing with my big sister. In kind of a what-that-old-thing? way, he told me that he still had it, and that he would set it aside for me. My mother had given him the watch in about 1960, but beyond that he didn’t know much about its history. Two years later my son and I took the Classic American Road Trip with Dad out west, and when we met up with him in St. Louis, he presented me with the watch. I had not even seen it in over 20 years, and was thrilled to behold it again. To my great happiness, the watch was in remarkable shape. The dial had only a few blemishes, although the lume was completely dead, and the hands were a bit fuzzy with corrosion. There were few identifying marks on it, but the caseback said “Seamaster” and “Waterproof” on it. I removed the caseback, and the caliber 284 movement appeared pristine, although it would stop running sometimes due to needing lubrication. 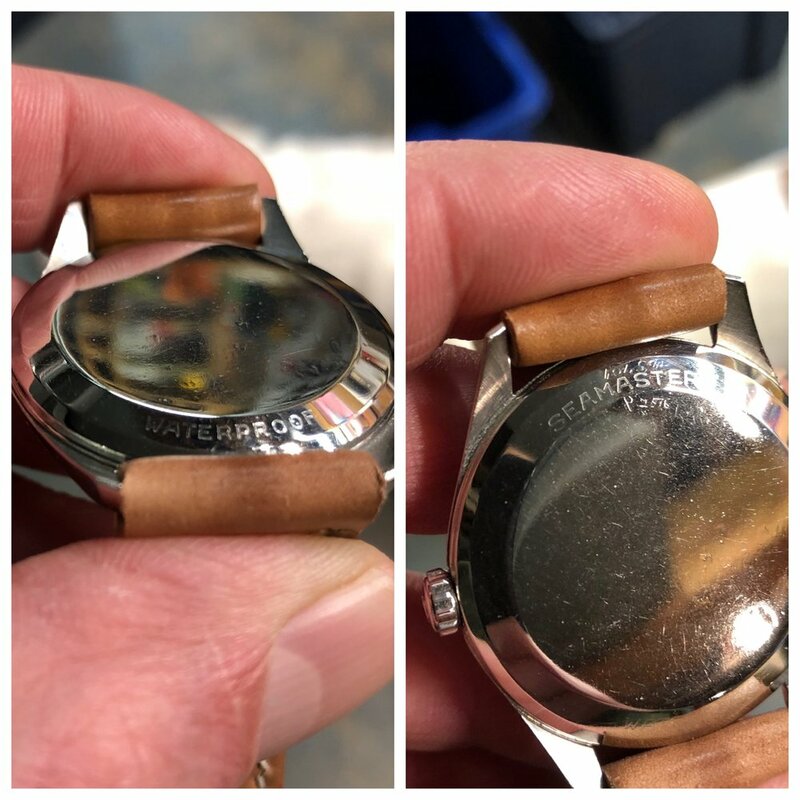 Factory caseback engravings are extremely faint. I don’t know a lot about Omegas, but I did know that in the 1940’s, 50’s, and 60’s they used the Seamaster model designator on watches as an indication of the cases’ waterproof qualities, not necessarily their suitability for diving as the name indicates today. Back home at the conclusion of our trip, I took the watch to my watchmaker and he noticed right away that the crown had come from an automatic, not a manual wind, and also that the word “Omega” on the dial was written using incorrect typography. He suspected that the watch had been redialed at some point. While most genuine Seamasters use a different movement and case, my research turned up many, many models that look extremely similar to Dad’s, including some that used caliber 284. I found only one that used the same case (ref 6042), a caliber 284 movement, and had the same words etched on the caseback. The thread that I found on this latter watch concluded that it was a genuine Seamaster and that it may have been redialed in its past, possibly explaining the missing Seamaster logo on its dial. 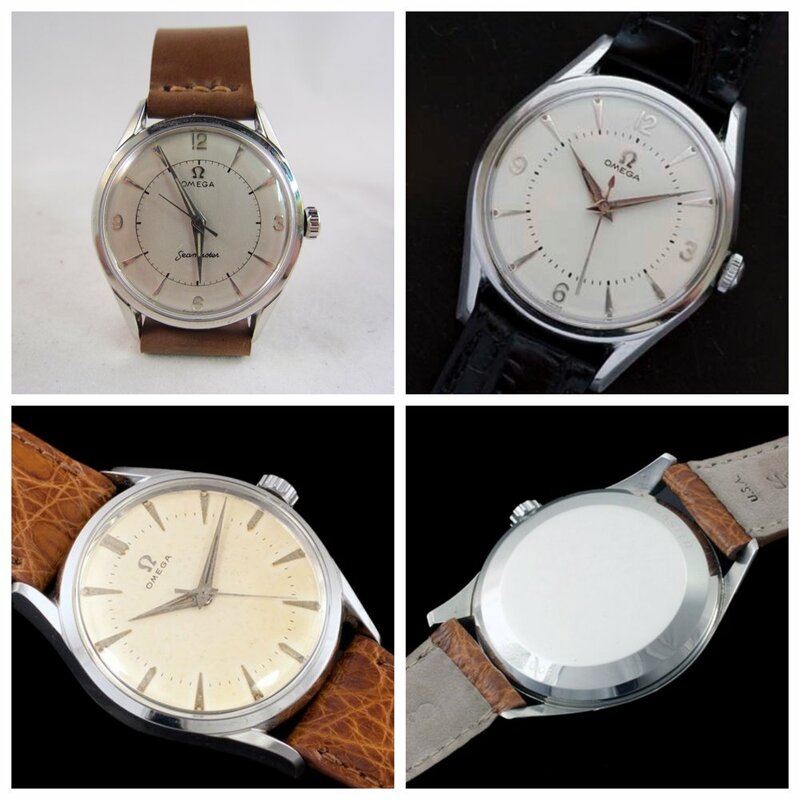 Clockwise from upper left: My Dad’s Omega, a similarly dialed specimen, identical caseback markings on another specimen, which has yet another dial variant. But another thread that I found clarified a bit more. The markings on the movement of Dad’s watch indicate that it was built for export to the US. These Seamasters were then cased in the US, and the dials said “Swiss,” not “Swiss Made.” They did not have the “Seamaster” logo on the dial even though they were otherwise identical to Seamasters sold in other markets. The existence of this other watch, my watch’s caseback and crown, the serial number that dates it to 1958, and the evidence that the watch has had its dial redone at some point all lead me to believe that the watch is an actual Seamaster, albeit an unusual one. The caliber 284 in Dad’s watch. The dial had a few blemishes breaking through that needed taking care of purely from a maintenance standpoint. So after consultation with my watchmaker friend, himself a 5th generation Swiss born and Swiss trained watchmaker, I decided to have the dial touched up. “Omega” is now written in the correct typography and the dial also includes the words “Swiss Made” and “Seamaster.” The latter additions may or may not be entirely correct, but it has become part of the story of the watch. The watch is a time traveler and a family treasure, now preserved for future generations, and one that my brother and I can also wear and enjoy today. The way the Omega will look for the next few decades. A gentleman’s silver pocket watch. This watch was brought from Paris, France in the year 1898 by George P Way, your great-great-grandfather. He was an Engineer, Inventor, and Lay Methodist Minister. On his death in 1918, his widow, Dr. Frances M. Way, gave the watch to her daughter, your great-grandmother, Treesa Way Merrill. She, in turn, gave it to her husband, Dr. Wm O. Merrill. They had twin daughters, Frances and Georgina. That brings it up to my time. When I married Georgina in 1935, the same year I opened my dental office in Detroit, Georgina’s mother gave the watch to me, and I used it in my office for 36 years. The watch is in excellent running condition. After having it in my possession for 44 years and using it as an office watch for 35 years, the time has come once again to pass it on, and I can think of no one else I would rather have it than my grandson Myron (Mike) Erickson. I know that you, too, will give it good care and some day pass it on. PS, Pictures in back of case are believed to be your great-great-grandmother, Dr. Frances M. Way (standing) and her two sisters. My grandfather’s pocket watch and his dime store Western pocket knife, which I found while researching this article. I have had the watch ever since, 40 years and counting, and have cared for it just as Pa asked me to do. Recently I took it to my watchmaker to have him take a look at it and polish the crystal, which he did up very nicely. He recommended not doing anything to the movement, which is in amazingly good condition for its age, and simply winding it and letting it run once a month or so to keep it happy. Zenith pocket watch. My foremothers look happy, don’t they? Zenith now charges a hefty fee for a production trace, but at least it’s good to know that they have been good stewards of their records. From their reply, I found out that the style of the silver case was referred to as Niello, and that some part of Pa’s story was in error. Obviously a watch that was built in 1912 could not have been brought from Paris in 1898, unless my grandfather was an Interstellar-style time traveler himself. So the story of the watch was changed when it passed to Pa, or perhaps the memory mutated in his own mind later. But as he requested, I will continue to care for the watch until I can hand it down to my own son. Two Zeniths, separated by 104 years of production. One lucky kid will inherit both. My kiddo will inherit both of these family heirlooms someday, when I stop enduring the flow and drifting with the current of time. And when he does, the advice will be the same: get it serviced, get it on someone’s wrist, and write down what you know about it. Fortunately, he’s a watch guy himself so I’m confident he won’t have to be told. Thank you for reading my blog. I always enjoy hearing from other enthusiasts about their experiences and I welcome any comments or factual corrections. Collecting the Model 1961 Soldier Knife, Part 1: Meet the Pioneer, the Speedy Pro of the SAK World. Coolest watch you never considered? Guinand. Presenting the ASFlieger.